When our teeth aren’t at their best, everyday life can become a little more difficult. Thankfully, First Line Dental is happy to provide the restorative services patients need to regain a confident smile. Whether you’re facing a small cavity or a serious a dental fracture, don’t hesitate to contact our dental office in Manchester, CT and schedule a visit – our team can help! Why Choose First line dental for Restorative Dentistry? At First Line Dental, we use tooth-colored composite resin instead of amalgam fillings which offers a flexible and seamlessly attractive way to rebuild the lost dental structure. It also forms a direct bond with the tooth enamel which means the results are longer-lasting and more of the natural tooth is successfully preserved. 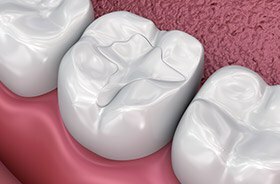 When a tooth suffers from damage, custom crowns are the typical solution to help rebuild its strength and appearance while preserving what remains of the natural shape underneath. 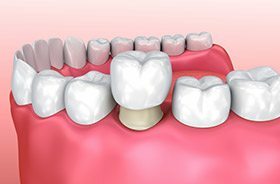 Here in Manchester, our team is happy to offer all-ceramic crowns, which are beautifully customized, seamlessly natural-looking, and very comfortable within the mouth. It’s very likely that no one will even realize!